When choosing a hoop system, most people would be satisfied with portable home systems. However, if you want more stability and closer to professional grade experience, you should check out in ground basketball hoops. These goals are put into the ground by way of putting concrete in a hole, which makes it so much sturdier than your average portable system. There are a lot of in ground systems to choose from and it is difficult to choose one. That’s why we are going to take a look at the best hoops in this class and compare them one by one in order to help you decide which hoop is best for you. 1. Goalrilla GLR GS 54 Basketball System – Installation for this in ground hoop is quite easy and straightforward. Digging the hole and pouring the concrete will take at least a couple of hours, as well as setting the anchors. Lastly, the assembly of the poles and backboard are another few hours. As you can see it will take at least half a day, which is pretty normal for this type of goal system, but the clear directions and simple procedure makes this an easy assembly. There’s also an anchor system for moving the hoop if there is a need, which is a very nice final touch. 2. Lifetime 71799 Height Adjustable In Ground Basketball System, 50 Inch Shatterproof Backboard – The assembly of the Lifetime 71799 is simple because of the clear instructions and the easily identifiable parts. At least 2 people are recommended to get the job done smoothly. If you are going to purchase the Lifetime Ground Sleeve, it is also an added work but it is very advisable especially if you will ever have the need to move the hoop as you are going to install it first with the cement and then add the poles later. 3. Silverback In-Ground Basketball System with Tempered Glass Backboard and Anchor Kit – Installation for this Silverback in ground hoop is pretty easy. Digging a hole, pouring concrete, and the pole installation is very simple and can actually done just by a single person. The backboard assembly however, needs a bit of effort compared to the other phases. It’s on the heavy side so at least two people are recommended to handle this in order to ensure a smooth assembly. 4. Spalding 888 Series In-Ground Basketball System – While the assembly of the Spalding 888 Series is pretty much straight forward, it would at least take 3 adults as the weight of the system is heavy. The steps are typical for an in ground system which consists of creating a hole, pouring cement, and installing the poles. The most work intensive part is the backboard assembly. The board is very heavy so it is very much recommended to use a truck bed if you have one. Even then, it takes three people to do it smoothly. You could use ladders in place of the pick-up bed but it will take some effort. 5. Lifetime 71525 Height Adjustable In Ground Basketball System, 54 Inch Shatterproof Backboard – Installation for the Lifetime 71525 is pretty much straight forward and simple but the amount of work to be done makes it rather tedious. This is because the hoop system consists of 3 pieces for the pole, which takes some effort to install properly, and also has many little parts which are easily misplaced if not careful enough. At least 2 people should do the install for quick results. As for the procedure, it is just the typical in ground installation which means creating a hole, pouring concrete, and the pole backboard assembly. There is an option for a sleeve which is a nice touch for those who do not want a permanent place for their hoop. 6. Spalding NBA In-Ground Basketball System – 54 Aluminum Trim Glass Backboard – Rounding out the list for installation is the Spalding 54 inch Aluminum Glass Backboard. Assembly is a little tricky. The manual is a bit hard to follow as there are cases where it instructs you to use a part that is not part of the package. A good tip is to read the manual before starting so you could check all of the parts and if there is anything amiss then call up the vendor. Now the actual installation isn’t that hard, just like your typical in ground hoop. It’s the instructions that make this goal have a low rating. 1. Spalding 888 Series In-Ground Basketball System – The Spalding 888 Series I Ground System boasts of Spalding’s well-known U-Turn Pro Lift System, which is featured in many of their products. Despite the weight of the massive backboard, adjusting the height takes almost no effort at all because of the U-Lift. The height can be adjusted anywhere from 7.5 feet, up to 10 feet. What’s great about this is that there are infinite increments for the adjustment, which makes it very attractive for those who want their hoop’s height fully customizable. 2. Goalrilla GLR GS 54 Basketball System – One of the easiest in-ground hoops to adjust, the Goalrilla GLR GS 54 uses the Height Adjustment Actuator. It’s so easy and seamless that even a kid can do it. The nice thing about it is that you can remove the mechanism after you reach your desired height, in order to avoid adjusting the goal’s height accidentally. 3. Silverback In-Ground Basketball System with Tempered Glass Backboard and Anchor Kit – The Silverback In Ground hoop uses an all-steel crank as it’s adjustment mechanism which is so easy to operate. The height can be adjusted from 7.5 feet up to 10 feet. Just like the Goalrilla GLR, this hoop system’s adjustment crank can be removed after adjustment. 4. Lifetime 71525 Height Adjustable In Ground Basketball System, 54 Inch Shatterproof Backboard – This Lifetime hoop uses their Power Lift Height Adjustment mechanism. Height adjustment is done with just the squeezing of the handle which makes it very effortless. What’s more exciting is the unlimited increments when adjusting the goal height from 7.5 feet to 10 feet. This is what a truly customizable height should be about. 5. Spalding NBA In-Ground Basketball System – 54 Aluminum Trim Glass Backboard – Just like the Spalding 888, this in ground hoop also feature the U-turn Pro Lift, which makes the height adjustment for this goal exactly the same as the 888. But why the lower score? Because while they share the same mechanism, the U-turn Pro Lift mechanism in this hoop is required to be lubricated. This may have been a mistake on Spalding’s part, which lowers its height adjustment rating. 6. 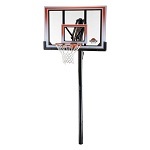 Lifetime 71799 Height Adjustable In Ground Basketball System, 50 Inch Shatterproof Backboard – The Lifetime 71799 uses the Action Grip mechanism in order to adjust its height. It’s quite easy to do, even children can do the adjustment. However, there are no other features which could set it apart from the competition, which is the reason for its low rating. 1. Spalding 888 Series In-Ground Basketball System – Spalding is very well known to put out very high quality products and the 888 series In-Ground Hoop system is no exception. The backboard is made of tempered glass, providing a professional feel and top-notch sturdiness. The one piece pole is made of 11 gauge steel, making it almost impossible to even put a dent in this goal. Lastly, the Pro-Image breakaway rim completes this very high quality package, which is very sturdy and can take rim-shattering dunks with ease. 2. Goalrilla GLR GS 54 Basketball System – Looking at the Goalrilla GLR GS 54 Hoop System, it’s pretty close to professional quality compared to other hoops in its class. The backboard is made of 3/8 inch thick tempered glass, which gives you the feeling of playing just like a pro hooper. The pole is a 1 piece, 5 by 5 inch solid steel, which is very sturdy and gives very minimal movement, and only on very strong impact shots. The DuPont Powder coating finish is the final touch which guarantees that this hoop system will be rust-free in its lifetime. 3. Silverback In-Ground Basketball System with Tempered Glass Backboard and Anchor Kit – This Silverback in ground hoop has a 60 inch tempered glass back board which is massive to say the least. There are some wobbling occurring during hard shots but it is minimal. While the pole is made of two pieces, it’s still very sturdy and stable, and does not cause any unnecessary movements during play. Overall, the Silverback In-Ground Basketball System is a high quality hoop. 4. Spalding NBA In-Ground Basketball System – 54 Aluminum Trim Glass Backboard – The Spalding 54 inch in ground hoop features a tempered glass backboard which, while very high quality in itself, doesn’t offer the professional feel like the 888 series does. The pole is a two piece 4 inch thick steel pole that makes this hoop very sturdy. However, even with all the virtually unbreakable components this hoop system has, there is noticeable wobbling and shaking especially in very strong shots. 5. Lifetime 71525 Height Adjustable In Ground Basketball System, 54 Inch Shatterproof Backboard – Expectedly, the Lifetime 71525’s quality isn’t the best, especially in its price range. The backboard is sturdy enough to do its job but of course the movement and shaking is noticeable, especially compared to other higher end hoops. The pole looks average but with powder coating, it is virtually rust-proof. The Slam-It rim can actually take some punishment, especially from thunderous slams, but still, be wary as it’s not only the rim that absorbs the impact. 6. 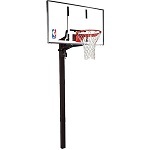 Lifetime 71799 Height Adjustable In Ground Basketball System, 50 Inch Shatterproof Backboard – Similar to the Lifetime 71525, quality isn’t the best, which is expected in the price range, but it does its job. It’s not really bad but compared to other hoop systems, the difference is quite noticeable, especially when in use, as semi-hard shots cause vibrations and wobbling. However, the good thing about in ground hoop systems is that no matter the quality of the hoop, the stability provided by the concrete base makes all of them virtually stable, and the Lifetime 71799 is no exception. Proving once again that when it comes to basketball hoop systems, Spalding is the name to beat. The Spalding 888 series combines ease of installation/use, smooth height adjustment, and durability to make the best in ground hoop in the market today. The option to choose a backboard size makes this goal system almost perfect. Not perfect because there is one drawback to this otherwise amazing product, and that is the price. It is the most expensive hoop in our review but the piece is quite justified. The Goalrilla GLR GS 54 deserves a mention here. While it is not as refined and durable as the 888 series, it is cheaper and is really worth a look if you are looking for a great hoop system that won’t break the bank. For the really budget conscious, the Lifetime hoops, while not as spectacular as the others that we reviewed, are certainly great options.